Queensland researchers have revealed new details of the molecular mechanisms that govern fundamentally important biological processes such as neurotransmitter release in nerve cells, and the uptake of glucose from blood in response to insulin signalling. When nerve cells communicate, cargo-carrying packages (known as vesicles) from one neuron fuse with the presynaptic membrane, releasing chemicals that signal to the next neuron. When insulin binds to fat cells (adipocytes) or muscle cells, proteins involved in glucose transport are delivered to the cell membrane through vesicle fusion, allowing the uptake of glucose from the bloodstream. This insulin-regulated system is essential for maintaining normal blood glucose levels. Both neuro-transmission and insulin-regulated glucose uptake involve members of the SNARE* protein superfamily. SNARE proteins on vesicle and cell membranes mediate the fusion process between transport vesicles and cell membranes, allowing the vesicles to deliver their cargo. Michelle Christie, Andrew Whitten and Jennifer Martin from the Institute for Molecular Bioscience at the University of Queensland used small angle x-ray scattering (SAXS) at the Australian Synchrotron and small angle neutron scattering (SANS) at the Institute Laue Langevin in France to investigate the interactions between a SNARE protein called Syntaxin and its regulatory protein partner called Munc18. The researchers used SAXS and SANS to create structural models of the Munc18-Syntaxin complexes. 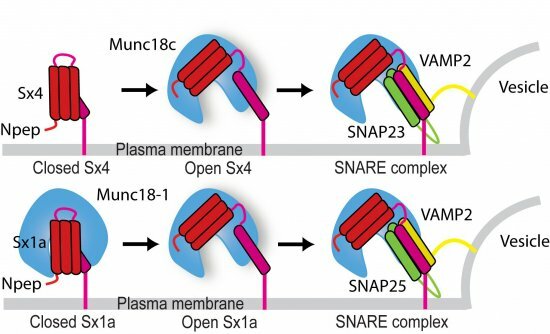 The researchers’ models showed that in neurons, Syntaxin (Sx1a) binds to its Munc18 partner (Munc18-1) in two different modes: open or closed. The open conformation leads to vesicle fusion but the closed conformation inhibits fusion by preventing Syntaxin from interacting with its cell membrane counterparts. The two binding modes can therefore regulate fusion and hence neurotransmission. In fat cells, however, Syntaxin (in this case Sx4) only binds to its Munc18 partner (Munc18c) in the open binding mode. The finding that Munc18 binds open Sx indicates that the Munc18:Sx complex does not inhibit membrane fusion as had been thought previously. The significance of the differences between the nerve cell and fat cell systems is that the inhibitory role of neuronal Munc18-1 is a specialisation that provides an additional layer of regulation to tightly control neurotransmitter release from nerve cells. AS head of science Andrew Peele said it was “great to see researchers using our SAXS beamline, with its world-leading resolution, sensitivity and signal-to-noise ratio, to answer questions like this about biological molecules in solution. These promising results will encourage more researchers to use synchrotron SAXS in conjunction with non-synchrotron techniques”. Image: Synchrotron data helped researchers determine that membrane fusion protein Sx1a can interact with regulatory protein Munc18-1 in an open binding mode as well as a closed binding mode. The equivalent membrane fusion protein in fat cells (Sx4) appears to bind its Munc18c partner only in an open binding mode. Open Sx bound to Munc18 can also bind SNARE partners in an interaction that underpins membrane fusion. The finding that Munc18 binds open Sx indicates that the Munc18:Sx complex does not inhibit membrane fusion as had been thought previously.